November 6th: I am thankful for friends. Anyone who has read this blog, or known me in person, for any length of time will know that I get very braggy about my friends. And for good reason! I'm not sure how exactly we have done it, but somehow we've managed to surround with the loveliest, kindest, funniest, most generous group of people imaginable. Somewhere in our youth or childhood, we must have done something good, I suppose. 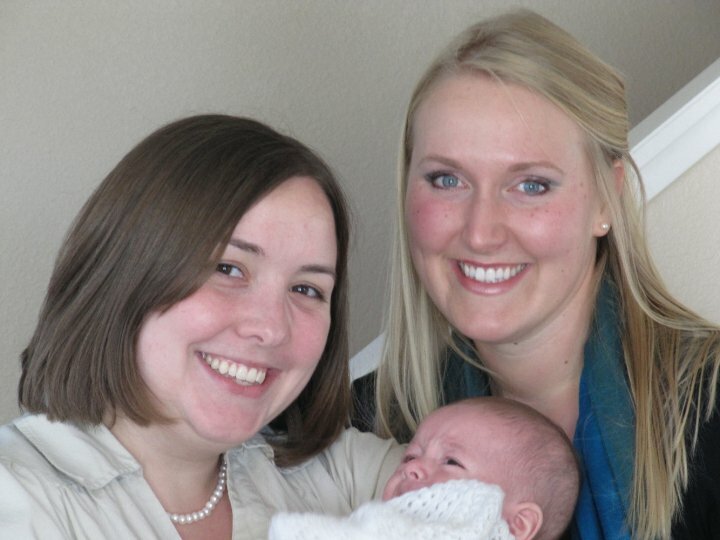 Me, Annika (one of my oldest and best friends) and a very little Espen. I was reminded of this fact yesterday when we sat down to dinner with some very good, old friends, as well as an old acquaintance/new friend and his lovely wife. We all had so much to talk about that we could hardly get a word in edgeways between the six of us and Espen, who was perhaps our liveliest conversationalist. It felt especially poignant to sit down with a new friendship and all the potential that holds compared to an old friendship so close that it borders on family. On the one hand we were all introductions and getting to know each other, on the other hand we were completing each other's sentences and reaching back into a shared history of many, many years of friendship. I am thankful for friends, old and new, near and far. I am thankful for the blessing of the family we are allowed to choose: our friends. Vi skulle hatt thanksgiving i norge! Vi må lære å være litt mer takknemlige her i det kalde nord.